A lot of ’80s-era kids probably entertained the fantasy of meeting their biggest childhood heroes in the flesh at one point or another. And no, we’re not talking about Michael Jordan or other sports stars of the time. We’re talking about someone far less, uh… athletic: Mario. Of course, had kids met the real-life Mario and/or Luigi depicted in this goofy and sort of frightening Mario x Mercedes collaboration commercial, they probably would have run for their lives and sworn off Nintendo games forever. But, beneath all the ugly prosthetics and hulking physiques of these game heroes come to life, there may have been, at least according to Japanese netizens, some far more approachable real-life athletes. Some Japanese net users apparently couldn’t help but notice an odd resemblance between the actors of both the Mario and Luigi characters depicted in the Mercedes commercials and certain popular athletes they’d seen recently. Specifically, Roger Federer and Novak Djokovic. Now, looking at the side-by-side comparisons, it seems feasible if not a bit of a stretch. After all, while the facial structures are certainly strikingly similar, we don’t remember Federer being built like an ox, and we’re pretty sure Djokovic is too engrossed in tennis training to learn how to robot dance. On the other hand, the theory certainly holds some water, especially given that Federer, at least, has actually appeared in Mercedes Benz commercials before and has even appeared in past commercials with a Mario-esque mustache. Even more persuasive is the fact that Mercedes is apparently refusing to either confirm or deny the rumor. 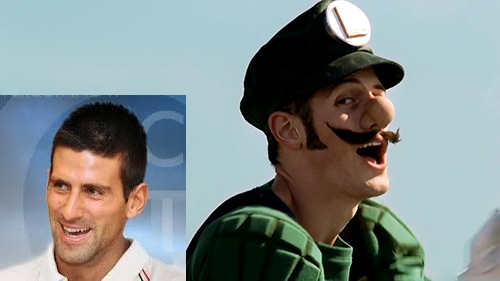 The Japanese apparently find the resemblances so compelling, J-television has even gotten in on the action, consulting a “facial recognition specialist,” who, in the below clip, says he recognized at least a 75% similarity between the Mario actor and Federer, and a 90% similarity between the Luigi actor and Djokovic. With Nintendo and Mercedes mum even in the midst of these wildly spreading rumors, it may be some time before the actors’ true identities are revealed. We’re going to go ahead and say these guys are probably just small-time actors, but if it really does turn out to be the tennis stars, we’re prepared to eat our plumber’s caps.